Europe's highest court says stem cells from human embryos cannot be patented, in a case that could have implications for medical research. Scientists say the Court of Justice decision may impede European research into the use of stem cell therapies, or drive research abroad. Others have welcomed the news, calling it a victory for human dignity. The ruling follows a challenge by Greenpeace over a patent for nerve cells from embryonic stem cells. Embryonic stem cells have the ability to turn into any tissue in the body. They offer the hope of one day being able to treat diseases such as Parkinson's, stroke, heart disease and diabetes, if technical hurdles can be overcome. The case concerns a method invented by a German professor, Oliver Bruestle, for converting human embryonic stem cells into nerve cells. The court's decision had been seen by some scientists as critical for research into the use of stem cells as treatments for a range of diseases. 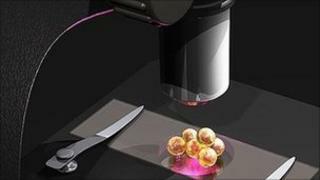 The European Court of Justice said in a statement: "The use of human embryos for therapeutic or diagnostic purposes which are applied to the human embryo and are useful to it is patentable. "But their use for purposes of scientific research is not patentable." It added: "A process which involves removal of a stem cell from a human embryo at the blastocyst [early embryo] stage, entailing the destruction of that embryo, cannot be patented." To date there have been just two human clinical trials involving embryonic stem cells - the first in Europe was announced a few weeks ago. There are, by contrast, many successful therapies using adult stem cells derived from the patient themselves. But stem cell researchers fear the ruling could damage this whole field of research and drive much of it abroad - to America and Asia. Patents are important if pharmaceutical companies are to recoup their investment in clinical trials and turn a profit. Lawyers are already suggesting there may be a way round the ruling, by patenting the therapeutic process rather than the stem cells themselves. Prof Pete Coffey of the Institute of Ophthalmology in London, who is researching the use of stem cell treatments for blindness, said the decision was "devastating". He told the BBC: "This could really halt the progress of stem cell therapies for as yet untreatable diseases." Prof Coffey is among several leading UK scientists who wrote a letter expressing concern over an earlier recommendation by the advocate-general of the court. Scientists were concerned that the ruling would threaten the future of medical research, saying companies in Europe would be less likely to invest in research to develop therapies using embryonic stem cells. But Greenpeace in Germany, which triggered the case, argued it was unethical to issue a patent based on cells from a human embryo. Greenpeace says it is not opposed to stem cell research itself, but to the idea that patents can be granted for scientific discoveries as opposed to inventions. The court ruled in the group's favour. Peter Liese, of the EPP Christian Democrat group at the European Parliament, welcomed the court's ruling. He said: "We are in favour of research and development in biotechnology, but human beings must not be destroyed, not even in the early stages of their development." The German Bishops' Conference, part of the Catholic Church, called the ruling a "victory for human dignity," and said it strengthened its view that a human being begins life at the moment of conception. Commenting on the decision, Prof Austin Smith of the Wellcome Trust Centre for Stem Cell Research, University of Cambridge, said: "This unfortunate decision by the court leaves scientists in a ridiculous position. "We are funded to do research for the public good, yet prevented from taking our discoveries to the marketplace where they could be developed into new medicines. "One consequence is that the benefits of our research will be reaped in America and Asia." Prof Bruestle, of Bonn University, who was initially awarded the patent, said: "With this unfortunate decision, the fruits of years of translational research by European scientists will be wiped away and left to the non-European countries. "European researchers may conduct basic research, which is then implemented elsewhere in medical procedures, which will eventually be reimported to Europe. How do I explain this to my students?"